Andy Chabot, Blackberry’s sommelier and food and beverage director, poses in the open kitchen at The Barn at Blackberry Farm. 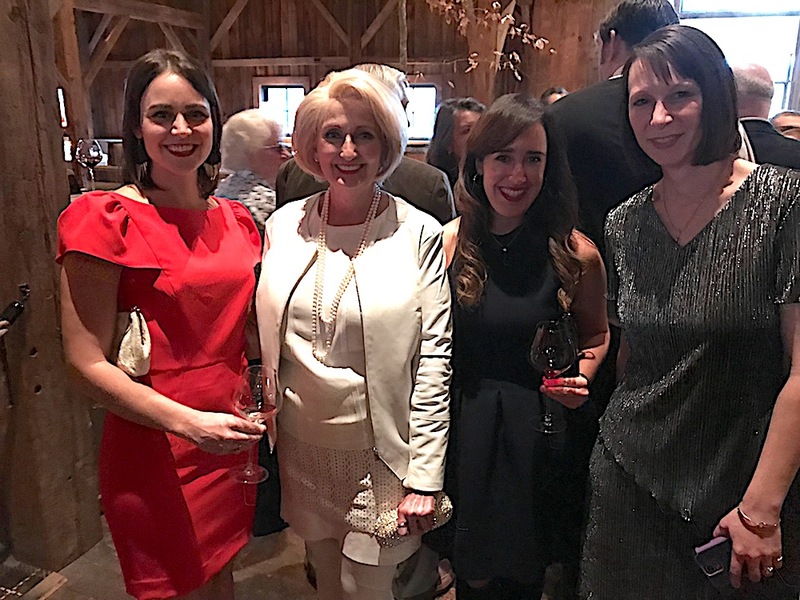 Seventy-five Knoxville Symphony supporters gathered Sunday at Blackberry Farm for what I think is one of the best opportunities of the fundraising year. You get to have dinner at our area’s premier dining establishment AND hear an intimate 30-minute performance by some of the Symphony’s best players. And you get a tax write-off in the process! It’s no wonder this is Jim and Natalie Haslam’s favorite event. So much so that they are happy to lend their names as the honorary chairs of it. Members of the Knoxville Symphony Youth Orchestra performed during the cocktail hour. From left, Daniel Choo, Elizabeth Joo, Miriam Ahrens and Katelyn Hedrick. Here’s the peaceful sitting room where they played. From left, David Colquitt, Jim Haslam, Annie Colquitt and Natalie Haslam. Annie is Jim and Natalie’s granddaughter. David and Natalie are on the board of the Knoxville Symphony. Knoxville Symphony Music Director Aram Demirjian, left, with his wife, Caraline, and the Colquitts. Blackberry’s Tegan Gilbert was serving some of the passed appetizers. Tegan offering tasty bites to Alexa Riley, left, and Libby Lewis. Here’s a closer look at the smoked quail legs with blackberry preserve. From left, Sherry Jenkins, John Winemiller, Gay Lyons and Drew Paul. John is a KSO board member. Russ Watkins, left, of Partners, and Marty Gibbs of The Christman Company. Russ is president of the KSO board. From left, Sara Rose, Susan Brown, Mark Grayson and Melissa Feinbaum. From left, Meg Sprouse, Patricia Bible, Paula Chesworth and Rachel Ford, executive director of the Knoxville Symphony. From left, Jon and Toni Lawler with Lee Ann Tolsma. Jon is on the Symphony board. From left, Susan and Michael Kohl with Holly Watkins. Elliott Nolan and Dr. Renee Repka. Mary Sue Greiner, left, with Charmaine Mamantov. Mary Sue is development director of the Knoxville Symphony. This was my favorite appetizer: caramelized onion and Benton’s country ham tarts. From left, Caraline Demirjian, Anna Gray, Barbara Arant and Dr. Frank Gray. Frank is on the Symphony board. From left, Karen and Harvey White with Mark and Cathy Mamantov. Mark is on the Symphony board. Tim Young, left, and Jeff Cupp. From left, John Wallace, Julia and George Shiflett, and Connie Wallace. Susan Brown and Bill Arant. Caryn Stoller Yount and Sol Holcomb. Here’s the elegant dining room in The Barn. I love how Blackberry Farm uses the most simple flowers as centerpieces. From left, Bob Lederer with Becky and Bob Paylor. Becky is on the Symphony board. My favorite course was the slow cooked farm egg with smoked mountain trout, chives and crispy potatoes. This dish alone was worth the price of admission (which was $500 per person, by the way!) It was paired with a 2014 Red Car chardonnay from the Sonoma Coast. What a fun course this was! Pork belly skewers with vanilla pickled fennel! Deanene Catani checks it out. Braised beef short ribs with potato puree, mint, grilled mushrooms, mizuna and charred onion. (Mizuna is an Asian green.) Wine was a Ramey claret from Napa Valley. From left, Randy Boyd, Nazzy Hashemian and Caraline Demirjian. From left, Hash Hashemian, Aram Demirjian and Jenny Boyd, a Symphony board member. From left, Caryn Stoller Yount, Melissa Feinbaum, Adrian and Larsen Jay. Adrian is on the Symphony board. From left, Dr. Doug Leahy, Marty Gibbs and Sara Rose. Hey, get a room! From left, Deanene and Tom Catani with Gay Lyons. From left, Craig Shelton, Susan Brown and Dr. Steve and Mary Ellen Brewington. From left, Alan Carmichael, Diana Condon and David Hunt. Barbara Arant, left, with Jim Haslam and Anna Gray. Bill Arant, left, with Natalie Haslam and Dr. Frank Gray. Harvey and Karen White, left, with Annie and David Colquitt. From left, R.J. Hinde, John Winemiller, Drew Paul, Sherry Jenkins and Dr. Renee Repka. From left, Mark Grayson, Dr. Martha Buchanan and Annette and Scott Brun. From left, Mary Sue Greiner, Rachel Ford and Holly and Russ Watkins. From left, Bill and Alexa Riley, Libby Lewis and Susan and Michael Kohl. Bill is president-elect of the Symphony board. From left, Cathy, Mark and Charmaine Mamantov with Toni and Jon Lawler. From left, Jeff Cupp, Tim Young, Elliott Nolan, Robbie Arrington and Travis Vickery. Lord, this flourless chocolate cake was rich! It came with Cruze Farm ice cream, milk jam and chocolate buckwheat, and it was out of this world! Cassidee Dabney is the executive chef at The Barn. Time for some night music! And a special evening draws to a conclusion. Filed under: Events, Food, Music. Bookmark the permalink. Since I don’t get much beef these days, the short ribs were my favorite. Food, service, music, company and atmosphere were delightful. Wolfgang would have enjoyed it. Alan: No doubt he would have! I was hoping that Alan would have to pass on his dessert (more for me) but no luck! Everything about that event was fabulous! Thank you! You guys do the fun stuff! Sara: Thanks for joining us at the Moxley Carmichael table. Monique: You all should come to this event next year. It is serious fun! What a wonderful night! Perfect in every way. Delicious food with, as always, amazing presentation. Fabulous music. Incredible setting. I agree completely with Gay. What a wonderful evening in every way! Such a special night and oh so beautiful!